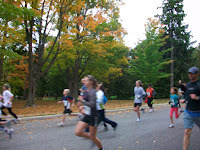 Are you thinking of running and training through the winter? You have finally found your comfort zone running and want to go faster, farther to get better, but you're thinking winter might just get in the way of your running habit! Can you keep running through the winter? Winter is cold, wet and slippery not to mention there are more chances for injury. For beginner runners it's best to keep your program simple and adjust your run/walks or running to just 3 days/week with some cross-training. There are a whole lot of runners that quit through the winter months and lose their fitness. They have to start all over again in the spring! This can be depressing when spring comes, the weight is back on and you're right back to where you started the last spring! You do not want to go backwards! If you have made running a habit, you need to be thinking of a new plan to keep your habit tight.